Great school and classroom. Loved the instructor and she is always extremely helpful after to make sure you find work. I highly recommend this school! I went here. Graduated in 2009. Hands on training. Small class sizes and teacher to student ratio is perfect. My questions were never left unanswered. I got a job right away in a dental office. I also worked once a week in an oral surgery office. THANKS ASDA!! Loved it here! :) got my first job as a dental assistant at the office I did my internship at:) today was my first official day and I love it!! I just wanted to let you know I got offered the job from total freedom today! I also wanted to thank you again so very much from the bottom of my heart for getting me the lead, you run an amazing school and I will always be grateful for that! You were the one who really made me realize I would love working front office that day you sat down next to me and that has changed my life in a new direction as I begin a new career path for myself! I took Britt’s class a few months ago. I just wanted to say thank you so much! I’m so thankful for everything Britt has taught me and all the doors and opportunities open to me now. I love my new job. Your Instructor is an amazing teacher and your whole program has changed my life! For the first time I truly feel I have made my family proud and found a career that I love! I just again wanted to express my gratitude and appreciation! Not just for Britt but also I appreciate everything you, bianca and whit have done for me!! Thank y’all so much! Thank you to all you guys for being the amazing people you are! The office I got hired at is 5 miles from my house and I had my first day today and I really like it! My name is Amy and I attended Arizona School of Dental Assisting a few years ago. I remember meeting with Lisa before I enrolled. As we talked I told her that I was interested in being in office management not in actual dental assisting. We agreed that it would be a great benefit to learn all about dental in order to be a successful Dental Office Manager. Most dental assisting school programs were 9-12 months. Since I was a working mom the 2 day a week schedule worked perfect for me. I was fortunate to be in a class that was taught by Lisa. Not only did I learn a lot from her, she made it fun. It was great for me to learn all the back office procedures and it helped me gain the knowledge needed to manage a team of experienced professionals. Not long after I graduated I found a job as a dental manager. I since left there and am at another company where I do all the hiring for dental assistants and well as dentists, and I am the billing and claims manager. I absolutely love my job and I know that I would not be where I am without the education that I received at ASDA. I would highly recommend this school to anyone who is interested in dental assisting, front office or office management! I’m Vanessa and I’d highly recommend this lively 12 week course, to anyone who is interested in becoming a dental assistant. The classes last 3 short hours, for 2 days a week! 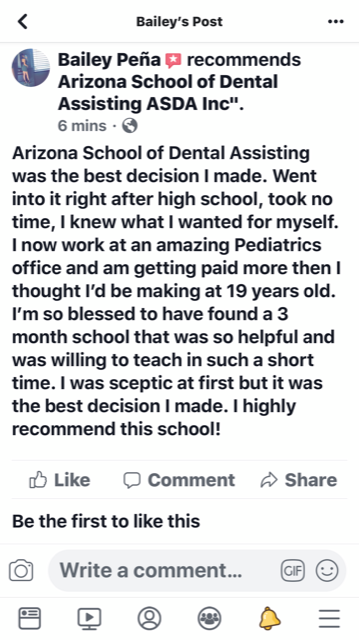 Before I found Arizona School of Dental Assisting, I looked into other dental assisting courses, and they were anywhere from 9 to 14 months and the prices were way too high. Brittany, and Whittney being the excellent teachers that they are, keep the classes simple, interesting, and enjoyable. My class began sometime in September of 2016, and before the end of the course (November 2016) I was hired at a wonderful office, off my externship. Being 3 months later, I am currently being cross trained as a general dental assistant, and as an orthodontic assistant. I couldn’t be happier with the outcome! GO ASDA! “Hey! My name is Kailah and I attended Arizona School of Dental Assisting in 2014. I moved to Missouri shortly after completing the program and landed a job immediately at a high volume, 6 chair office. Within a year I passed my basic skills, made by the Dental Assisting National Board, which most of my coworkers who went to longer programs and more widely known schools couldn’t pass. I also received my expanded functions in restorative I, fixed prosthodontics, removable prosthodontics, and will be taking the restorative II over the summer. I am lead assistant at my office and have earned all of this in 2 years time. I attribute all of my success to the knowledge I gained at this wonderful school! Because the classes are kept small, there is more one on one learning and never a chance for anyone to slip through the cracks! Plus the teachers are wonderful and truly want you to be successful. “This school is absolutely AMAZING. The owner, Lisa, likes to get to know the students personally and always does her best to help you out. The lady at front, Bianca, is always willing to help students with anything they need, if its faxing resumes to offices or helping you figure out a financing issue, she is on top of it! The instructor, Brittany, was phenomenal. She was well trained, professional and very knowledgeable about the topics being taught. She was also very kind and encouraging! The campus is very clean and very organized. There are numerous xray machines, a lab and different areas for clinicals. The classes are small and very intimate! You will learn a lot and have a lot of one on one attention with the teacher. “Choosing this school to train me in the dental assisting field was the best decision I could have possibly made. Not only is the staff friendly, knowledgeable and motivating but they also work hard at locating and informing the students of upcoming job placements. The instructor took the time to make sure that I was comprehending all the intricate detail that goes into this field and always did so with a smile. “Thank you for the assistance with continuing my education in Dental Assisting. The assistance improved my career goals and definitely my future. I am currently employed with an excellent Company, Greenberg Dental and Orthodontist. My salary increased from $12.00 to $15.00 hourly after three months of full time employment and a promotion to Team Lead for a very talented Dentist and wonderful Dental Assistants. I look forward to my new career and job retention outlook thanks to the courteous and helpful staff with your office. “While doing my internship, I was paired with another intern from one of the “other schools” that had a nine month program. Initially, I was a little intimidated thinking she may know a significant amount more that I. However, when it came to practicing in the actual dental office I found that our knowledge was equal. We were both learning the same things and I did not feel like she had any actual advantage over my schooling. “I attended this school in 2013, and I would have never fathomed that it would benefit my life in so many ways. My instructor was genuinely invested in my education, and when I had any problems or struggles, she was always the one to help me through them. The class size is small, granting the perfect opportunity for one-on-one interaction with not only instructors, but also classmates. Studying was a breeze, because the school maintains a professional atmosphere, and it was always quiet enough to allow me to focus on my studies. The instructor, Brittany, also gave me great study tips when she would assign class work, and I still use those tricks today. Lisa, the president of the school, worked her hardest to make sure that the skills I developed were perfected and marketable. The dental industry is huge, but it is really tight knit. It is important that an assistant is competent AND confident in their skills, and this school is the place to go to master both areas. Lisa and Brittany have become my allies in this profession, and any time I encountered any difficulty, I turned to them for advice, and I continue to do just that for a very long time. Any person who speaks negatively of this school, or it’s program definitely assumed that they could just commit a bare minimum to it and succeed, but this school principle’s itself on sifting the slackers from the achievers. You WILL be challenged, and you WILL be better for it. “I started my dental assistant education at Estrella Mountain Community College, after attending classes there for two weeks I had had it. Three and a half hour classes strictly lecture and overhead. Twelve to fourteen chapters to be completed in a week and the chapters were 50 pages long at a minimum. I had finally had it when I was told we would be having only a 20 question test on fourteen chapters. I asked what are we suppose to study and was told by the instructor “just read.” There was no hands on and all the instructor did was outline the chapters on the overhead, what was the point of going to class I wasn’t learning anything!!! I asked the instructor how I was suppose to get a job when I didn’t have any experience she told the class “thats why you go to dental offices and beg the dentist to let you observe and thats how you learn.” I was seriously appalled. So that night I came home in search of a new school, so I googled dental assisting schools and AZ Dental Assisting school popped up. I looked at the website and was immediately impressed. I sent the school an email and told them my situation I was set up for a tour of the school the following day. I have now been attending for five weeks and I just love everything about this school. Its hands on and the instructors are great!!! I really am in disbelief at how much I have learned in such a short amount of time. Lisa and Brittney are great, not only are they awesome women but they are such good teachers. Anything you have questions on….they have an answer and they make sure you know and understand every single thing we do in class. I have never been more excited to start a new career and it is because of this school that I feel like I will finally have my dream job. I cannot thank Lisa enough for what she has brought into my life! If your having second thoughts about this school or just thinking hmmm should I do this. Stop thinking it and just do it, you will not regret it and you will not only be given the tools for a great career but you will feel accomplished and smart lol. Not to mention you can make great friends along the way!!! “I just want to tell you thank you! For keeping my in faith and telling me this was going to happen for me. I finally got a job in the Dental field! I cried so much because I prayed for this day to come from years way back. I am an official Front Office Dental Assistant at Chandler Bright Family Dentistry. I started yesterday 🙂 all I can say is I am so happy. “So Just wanted to say That this school is Amazing! Not only do they teach what you needed to know about Dental assisting but they help find the right type of Dentistry field that is best for you! The class size is small, which is so perfect, you get that one on one attention with the instructor. You actually build a great professional relationship with them and a great bond with your classmates. This was the best decision I made, the results I got from this school was just great. I worked in the Orthodontic field for about 6 years, but I never pursued an education in the field, all the experience I had wasn’t really being paid off just because I didn’t have the Certificate saying that I went to school and got taught the material. The greatest compliment always comes from our past Students.